All right, it’s been a few months—how are your day planners working out for you? Care to share updated reviews on the planners you wound up with? Each month begins with a one-page month-at-a-glance calendar, and then there is a separate page for each day of the month. I’ll upload a sample page at the bottom of this post. Because this planner uses a page-per-day format, it’s pretty thick (about the same size as the CWDP menu & lesson plan version) but the Mom’s Daily Planner doesn’t include extra material like the menu pages. The planners that are laid out in a two-pages-per-week format seem to include more bonus materials like to-do lists. *About the BusyBodyBook—I just discovered they are offering free downloads of weekly "Fridge Grid" pages for anyone who’s interested. They would make great chore charts! The publisher is also offering a 25% discount on the 06/07 planner. Enter Fundraiser Code BBBLOG during checkout out to receive your 25% off. There were a few quotes in the Mom Agenda planner that I didn’t agree with, so I put a blank sticky address label over each and wrote a Bible verse! (For longer quotes, I either used two labels or added a pretty flower sticker.) Hope this helps! I ended up buying the Circle of Days planner (although it isn’t exactly a planner in the same way the other ones are) and while I liked it initially I ended up giving it up. Juggling the post-its ended up being a pain and I found that I wanted to be able to see more of my day than just the morning, afternoon or evening at one time. It made me feel like time was sweeping by too fast when I would have to move ahead to the afternoon when I had only done two of my morning post-its. I also thought the ribbon, while very attractive, was a little difficult to work with. It made turning the pages a little unwieldy and occasionally awkward. But still, it was very pretty, and I wish that it had worked better for me. I bought the Mom Agenda from a local shop in August. 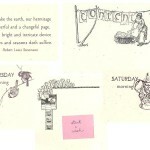 I love the days of the week side by side-a feature that I just have not found in other planners. This way I can get a better feel for our week at a glance and see what part of the days will be busiest. It’s a good planning tool for me in that way. I also really like the cover, which is quite sturdy and with its satin finish, slips in easily into whatever bag I’m carrying without getting corners or binding caught. I thought I would miss the spiral binding, but actually like this better. It still lays flat for me and I don’t have to worry about pages starting to fall out as I get to the end of the year. The pages are lovely to write on and I’m simply motivated to use it based on how pretty it is. I also find that having the two, ribbon place markers is very helpful, especially since this calendar has so many departments. I am embarrassed to admit that I actually had to go get my calendar to find the quotes mentioned above. I guess the fact that I never noticed they were there despite the fact that I use it daily is a sign that I am far too busy!! To my defense, I have the pink calendar, and the difference in the ink color and paper is subtle. The negatives- It has too many sections with too many things for my taste. While the company clearly didn’t want to leave out anything, I would just prefer to have a dozen or so blank pages at the end for notes rather than a section for vacation planning, a section for gift lists, etc. It just takes up a little too much space for my taste and makes the calendar a bit thicker than it needs to be. They sell a desktop mini, but then you lose the layout that I like as it is set up differently. It is also expensive at $40 and the shipping fee is exorbitant ($10, I think it was), although I was able to find a local distributor-and they had a 20% discount for back-to-school things as well, so it ended up being about $32. I do think that you do get what you pay for as it is made of high quality materials compared to most desktops that I have used. If I use this for the entire year, it will really say something. I already use it for more things that I have any prior calendars and I find that the longer I have it, the more that I am finding use for some of those extra pages that were so “irritatingly wasteful” to me in the beginning. I give it a four out of five stars overall. I’m not a mom, but I’m a planner geek and have really your planner posts. One that some may find works well for them is the Planner Pad (www.plannerpads.com)Though it’s not specifically mom-oriented, it’s very versatile and is the best I’ve found yet for juggling my husband’s and my schedule plus work plus a side business, plus all the etc. that goes along with life. So if anyone has tried something and still isn’t in love, I can’t say enough good things about the planner pad, so it might be worth a peek. 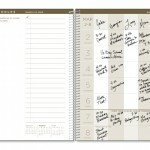 Last year I found the “Mom’s Plan-it” calendar at Christianbook.com. It is similiar to the “busy body” planner, with spaces for each family member. I love it, but it’s for the wall, not your purse. This year, I bought the “super sized” one (which still only has space for 6 family members). They also make purse sized plan its. I have a very simple version of it, but you can get one with more spaces, etc. Check out www. Christianbook.com. Gosh! This continues to be an interesting topic….I read Amber’s honest appraisal of her experience with my Circle of Days, and I felt sorry that it didn’t work well for her. And I also wanted to write to say I that I got a bit fed-up with all those post-it notes, too. They made me feel I have too much to do, which is true, but one doesn’t want to be constantly reminded. And they aren’t attractive (smiling here, but that really does put me off). It works very well, I have discovered, as a training aid for myself and my children when we are learning new rhythms and routines.And for someone more disciplined than me, it probably works just as I intended. What I am aiming for is that most tasks do become a regular part of my days and weeks, and that seems to be falling into place at last. And I am enjoying having the Circle of Days opened to the appropriate page and just looking at the empty space and absorbing the fact that it is “Saturday morning” (or whatever) and “what do I want that to look like”.I am also plotting to buy some of that glue that works like post-it notes and use it on inspiring pictures I cut out and poetry and such, and add those to the pages, along with my tasks that I need reminding about. Gosh, my head is still spinning trying to decide what planner would work best for me! I really want to put a specific one on my Christmas list, but which one??? Thank you for your reviews, they will help me considerably!